Finally, a great base product for your creams, lotions, body milks and mist. And this lotion base has been developed using a different technology, so it's easy to use to create your recipes. Most lotion bases are pre-blends of water, oil, and emulsifying wax. Using emulsifying wax requires that the formula be heated to melt the wax and create the O/W bond. Those lotion bases tend to have a wax-like feel due to the emulsifying wax and often create drag on the skin and pilling after a second application. The viscosity (thickness) in your final product is adjusted by the amount of water and additives you include in your final formulation (which might mean a lot of tweaking!). Lotion Base CM is a totally cold process product because it does not contain waxes which need to be melted. The lotion base kit consists of two products: Lotion Base CM - a water-thin cream base and, Polymer SP - a cosmetic grade thickener, which has been pre-mixed with an emulsifier. No wax or alcohol! Your product is simply made by mixing 10% Lotion Base CM with 90% water (Distilled), which makes for a very cost effective formulation. After these two ingredients are blended, you can add up to 5% vegetable oils. Next, the thickener concentrate, Polymer SP, is added to your blended lotion base at levels of 3% - 9% to achieve a viscosity from very thin, like a body mist, to very thick, like a night cream. Finally, incorporate your preservatives, color and fragrance. You’ve got a finished product in three easy steps! This kit will make up to 2.5 gallons of lotion. A LIGHT SOLUTION OF BLEACH IN WATER. We suggest using a digital scale to measure your components. Choose the batch size you wish to make from the table below. Set your scale for either ounce or gram measurements. Measure your ingredients in the quantities listed in either ounces or grams. Remember, all measurements are listed by weight, not by fluid ounces. Mix these products together for 2-3 minutes using gentle agitation with whisks or mixing spoon. The oil and water will not emulsify, but you want the mixture to be well blended. Stir your container of Polymer SP well before portioning. Choose the amount of Polymer SP to add to your Phase 1 preparation, using the Consistency Table below to choose the end product you wish to make. IMPORTANT: You can always add more Polymer SP to increase thickness, but if you start TOO THICK, you will need to prepare another Phase 1 batch to re-balance your desired viscosity. So if you are not sure, add increments of the Polymer SP to achieve your desired consistency. Slowly pour a stream of your Polymer SP portion into your Phase 1 base, while continuously blending (a stick blender works well). You will notice the lotion start to thicken after mixing for about 2 minutes. Continue mixing for a full 5 minutes to ensure that Polymer SP is completely dispersed to activate the emulsifier and the thickener. When you’ve achieved your base consistency, add your preservative, color and fragrance, and blend well. Your ready to package! -Lotion Base Tutorial Be the first to leave a comment for this product. 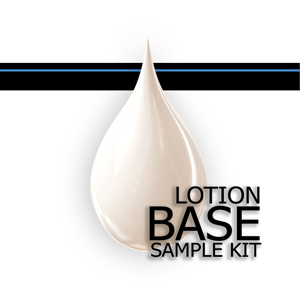 Notify me when Lotion Base Sample Kit is in stock.